"Are your methods of working a state secret, Mr. Boothby?" "I don't think so. I believe that the morning hour has gold in its mouth. In summer I am at work by five o'clock. Just now I am later, but certainly not later than seven. My average day is the orthodox eight hours." "It goes without saying, considering the immense amount you have written in these last two years, that your daily task must be very considerable?" "I should say that on an average I accomplish at least six thousand words a day. Of course part of that is dictated to my wife, who not only helps me in this way, but type-writes the final copy of all my work. But her assistance is not merely mechanical. Her interest in the development of my characters is unbounded. From the moment a character is outlined, my wife watches its growth with a sympathy and insight that mean more to me than I can well express." "Do you arrange everything beforehand? " "Provisionally, yes; but the characters always get the better of me in the end. They marry and otherwise dispose of themselves, quite independently. I know no more what may happen than I know whether the work will win the public favour." "You have many surprises, then? " "Particularly in the latter case. The success of Nikola, f or example, astonish me. But really this talk about myself is too much. I'd far rather hear about your work. My friends say in conversation I am a creature of digressions and sudden flights, always neglectful of the point." "At present however it is my duty to keep you to it." "Ah, there now, you remind me I am being interviewed." "Then it must be my business to make you forget it. Now you see I have outlined my work for you, so we'll return to our theme with a very momentous question: Who is Dr Nikola?" "That I am afraid I may not tell you, in view of future developments of that character. The name however was suggested to me one day in the train by seeing the name of Nicolo Tesla, the Italian electrician, in a public print. By the way, the Doctor's cat has won curious admirers. The other day a lady, quite unknown to me, wrote imploring me to tell her the name of Dr. Nikola's cat in order that she might call her own, tabby after the 'dear creature.'" The conversation drifted away pleasantly to the joys and sorrows of the author's post-bag, concerning which Mr. Boothby has many good tales to tell. Among its chief joys are kind remembrances from brothers of the pen. Many of these, in the shape of autographed portraits, adorn the walls of the study. Among the photographs are those of Walter Besant, Clark Russell, Robert Louis Stevenson, Stanley Weyman, Anthony Hope, Rider Haggard, and Rudyard Kipling. "Talk of the jealousy of authors!" he cried. "There surely never was a greater fallacy." Then our talk went further afield. You must tell me something of your Australian life and travels," I suggested. "My first book, 'On the Wallaby,' as you are doubtless aware, contained a record of my journey across Australia in '92. You will see my course marked on that map. The journey was made with one companion, and occupied thirteen months." "What means of transport had you?" "At first some pack‑horses, but these died off, then a rough bush buggy and a pair. They went blind latterly and we christened them Cyclops and Polyphemus. Once or twice we were at death's door, but somehow we pulled through. At the end of the journey we had a nine hundred mile row. Perhaps you'd like to see a relic of the expedition ‑ which I always keep by me for old acquaintance' sake ‑ my cooking pot," and from the corner Mr. Boothby produced the venerable utensil to which in a sense he no doubt owes his preservation. Mr. Boothby's travels in the far East, New Guinea, and his sojourn in Thursday Island came next under review. Thursday Island is to him a place of many memories. "Here," he continued, "are photographs of the pearl divers. There you see the huge oysters of these fisheries, valued not so much for pearls as for mother‑of‑pearl." Other photographs, too, Mr. Boothby showed me, photographs of places to which he has given a literary interest. "There," he remarked, "is the house where the scene of 'A Lost Endeavour' is laid, and this again is the scene of 'The Marriage of Esther.' Of the strange wild life of Thursday Island he has much to tell, but a novelist's incidental anecdote is sacred, for it is doubtless the germ of the future book. With every phase of Australian life Mr. Boothby is acquainted. As he turns over his photographs with the visitor he is brimful of graphic comment on every picture. "Here," he remarked, "is a capital picture of a Queensland sundowner." The picture represented a solitary figure standing in pathetic isolation on a boundless plain. "Yes; the lowest class of nomad. For days they will tramp across the plains carrying, you see, their supply of water. They approach a station only at sunset, hence the name. At that hour they know they will not be turned away." "Do they take a day's work?" "Not they! There is an old bush saying that the sundowner's one request is for work, and his one prayer is that he may not find it." The pathos of the Australian solitudes has entered into Mr. Boothby. He tells, as one who understands, how men who live apart - three hundred miles perhaps from the next neighbour ‑ are steeped in the poetry of Adam Lindsay Gordon, whose verses they recite to lighten their solitary toil. The humour, too, of the life ‑ rough and ready pungent humour ‑ he has made his own. There is one grim joke of an arrest ‑ but no, my lips are sealed. "I’m putting that into a story one day," said Mr. Boothby. So the conversation flourished until at last Mr. Boothby arranged the pleasantest of interludes. "Come now," he said, "and let me introduce you to my wife," and a few moments later, in the enjoyment of Mrs. Boothby's charming company, I quite forgot my part of interviewer. As we chatted on a multitude of themes my host suddenly surprised me by remarking, "Now you must see Dr. Nikola." The situation was exciting. I waited breathless for the coming revelation. Was the house uncanny, I wondered? Could the novelist really compel spirits and materialise the creatures of his brain?
" Nik, Nik he called mysteriously. "Nik!" There was a pattering in the hall, an in bounded nothing more phantasmal than a very hearty bull‑pup, of the friendliest disposition. He was clever too, for at his master's bidding he pretended to have a violent cold in his head, sneezed, said "wolf " with perfect articulation, and played endless other tricks. Young Nik's great friend is old Nik, otherwise Beelzebub, an aged bull‑dog of wonderful sagacity, and the hero of "The Beautiful White Devil," who entered next at his master's bidding. To little Dr. Nikola, alone of dogs, old Bel is kind and even fatherly. "Once in Nik's earliest puppy days, " said Mr. Boothby, "Bel, the little one, had been playing with a bone in my wife's morning‑room and had left it behind him when he followed her to the drawing‑room. Presently he became very unhappy and began to whine, when the old dog rose from before the fire and went out of the room to return with the bone, which he placed before his little friend as if to comfort him." Then at the word of command Bel stood stock still while Nik jumped over him, backwards and forwards, not once but many times. A visit to Mr. Boothby's aquariums followed, for my host is a collector not only of old books, but of rare and curious live fish, which he brings together from all quarters of the globe. One can only mention his rarest and most interesting specimens, the fish with rudimentary legs and hands from the deep lakes of Mexico city. One of these fish had a leg eaten off, but Nature repaired the damage, and now the new leg is in its place. "That other little fish," said Mr. Boothby, pointing to another tank, "I found one morning on his back, more dead than alive, but by way of experiment I gave him a good dose of brandy, and he soon was as lively as ever." As we returned to the study. Mr. Boothby told me of his early home at Salisbury. "I was born in Australia," he remarked, but at six years of age I came to England, where I was educated. I lived at Salisbury in a quaint house ‑hundreds, of years old. It was a strange old place, and the man who would have been impervious to its influence would not have been able to say much about his imagination. I used to weave wonderful stories about that house to myself then." "The future novelist was making, I see." "I have always been drawn to literature. I was always a scribbler. At sixteen I returned to Australia and began my real life." "Of which your books are substantially the record?" "More or less, yes. Some of my earlier short stories found their way into Australian papers. The very first I always keep by me as a salutary antidote to swelled head. When orders come in pretty freely one is sometimes tempted to feel a little elated, but a glance at that story conduces to plainer thinking." "I should like very much to have a list of your principal works, if I may." Mr. Boothby turned to consult a ponderous ledger. "Well," he confessed with some reluctance, if it interests your readers I am agreeable. In 1893 I wrote 'On the Wallaby,' in 1894 'In Strange Company,' in 1895 'The Marriage of Esther,' 'A Lost Endeavour,' 'A Bid for Fortune ' and 'The Beautiful White Devil.' This year has brought forth ‘Dr. Nikola,' and many other serials and magazine stories both in this country and in America and Australia. 'The Fascination of the King' is running in Chambers's Journal. " Thereafter, with no reluctance at all, Mr. Boothby produced another ponderous book, of which he seems fonder than he is of the ledger ‑ the record of his favourite bull‑dogs' pedigrees and performances, kept on a most ingenious system. By the time we had exhausted that record the afternoon had slipped away, so after a word or two more on various subjects, a hearty laugh over a funny picture of the novelist and his illustrator, Mr. Stanley L. Wood (drawn by the latter), and an examination of the model stage on which my host is working out a new play, the moment of departure came, and I took cordial leave of Mr. and Mrs. Boothby. An interview with prolific crime, mystery and fantasy author Fergus Hume (1859-1932), best known for the The Mystery of a Hansom Cab (1886), which opens in Melbourne. Hume famously sold the rights of the novel for 50 pounds and the book subsequently became a great bestseller, selling over half a million copies in England. From The Maitland Mercury & Hunter General Advertiser, 19 January 1893. A Talk with Mr. Fergus Hume. "The only allusion I care to make to the 'Hansom Cab,"' said Mr. Hume, with a shrug of his shoulders, "is this. I wanted to go in for dramatic writing more than for novel writing when I was in Melbourne. Of course, I couldn't get my play accepted because I wasn't known at all. So I thought if I could write a book to attract the attention of managers, even a small book, that I might get a chance of getting a play on. I must add that on this determination I went to several booksellers in Melbourne, and asked whose works were most popular with their customers. The unhesitating reply was Gaboriau's. I had never heard of him myself, but I read his books and I thought 'Well, I can do as good as this at all events' and so I wrote the 'Hansom Cab,' which was pure fiction, not a line of truth in it. It was published and made an instantaneous success." "I thought," I observed, "that it was published in England by the 'Hansom Cab Co,' and not in Melbourne at all." "Yes, it was published in Melbourne at my own risk and expense. It was brought home by Mr. Trischler here, who formed himself into what was called 'The Hansom Cab Co.', with which company, however, I had no financial connection whatever. My connection, however, with Mr Trischler himself, was not destined to be a long one, and now my books are in the hands of various well-known publishers in London. The 'Piccadilly Puzzle,' I might mention, which was published by F.V. White and Co., has the distinction of obtaining the highest price ever paid for any 1s book in England. "To go back to the 'Hansom Cab,' of which I may say I am heartily sick now, I want you to understand that I am doing all I can to get away from it. Everywhere and with everyone it is the same. Zola is known by 'Nana' when he ought to live by 'La Rêve'; Sullivan's 'Golden Legend,' one of the finest pieces of the century, is condemned, at all events, on the continent, because of his 'Mikado.' I utterly object to a man being committed by the public to one line only. Because a man makes a fool of himself once, to put it strongly," cried Mr. Fergus Hume, with great energy, "he is not to go on making a fool of himself all his life. I will not be bound down by the Tradition of the Hansom Cab." I laughed heartily. "Hear, hear," I said, "you remind me of Mark Twain, who said exactly the same to me last year. Well, now tell me what are your aims and ideas for the future, and how do you propose to get away from your traditions?" "Well," he replied, "I want to drop the ordinary novel of commerce for what I may term the 'Romance of Fantasy,' of which the 'Island of Fantasy ' is the first." "Now," said I, "how do you blend the fantastic and the real, the impossible and the possible, so as to make it palatable to the ordinary common sense English reader?" "I try to manage so as to make the improbable seem possible. I am following up this 'Island of Fantasy' with 'Aladdin in London,' which will be a similar work; and the third of the series upon which I am now engaged is called 'The Harlequin Opal.' In 'The Island of Fantasy' I endeavour to reconstruct the old Greek civilisation and adapt it to the present day." "Ah," said I, "much as Conan Doyle reconstructed the fourteenth century. He told me he read 150 works bearing on that century before he wrote that work." Rang loud with man's acclaim. And white rose burns as fire. "There, that is my idea," said Mr. Hume. "I want to show what money can do and ought to do. Think what lies in the power of such a man as that young Mr. Astor, whose father died the other day, and left him £15,000,000. Now there is the ethic intent of the 'Island of Fantasy,' but the critics looked on it, kind as they were to me, too much in the light of a fairy story." "Ah," said I, "but the critics haven't always been as kind to you, have they?" "No," he replied, "they have been hostile for many years. They believed no good could come from the writer of 'The Hansom Cab.' But I am bound to say sometimes critics are very irritating. Look at Rider Haggard for instance, how they are always pitching into him for being too 'Bluggy,' as Toddie used to say. But battles can't be fought without blood. If you describe battles you must do it realistically -- the critics seem to expect you to do it in rose-water English. "Here is an instance in my own case. In one of my books one of the characters improvises some wretched doggerel on the spur of the moment; it was only meant to be doggerel, and the critics with ridiculous unfairness actually quoted the doggrel as 'a specimen of Mr. Fergus Hume's poetry.' And again, they are so fond of asking why such and such a book was written. 'What is the object of it?' say they. Well, as De Quincey said: 'There is no moral, big nor little, in the "Iliad."' I don't know that books are written primarily, as a rule, with any other object but that of getting money for the authors of them. I have noticed, curiously enough, that the most spiteful reviews appear in women's papers." "You are about to produce a volume of Fairy Tales, are you not, Mr. Hume?" "Yes," said he; "and I trust the public will like them. 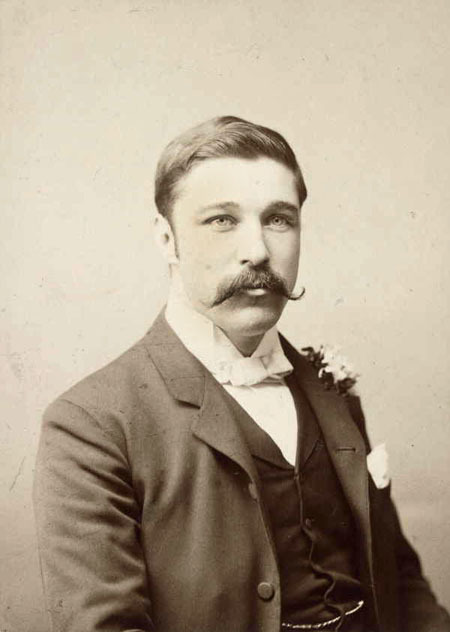 Mr. Harold Boulton and myself are hard at work also upon the libretto of a comic opera -- a new departure -- and to which the music is being set by Mr. Charles Willeby, whose songs are already well-known in London." "Well," I replied, with a laugh, "you are certainly drifting very far away, and in very many directions, from 'The Hansom Cab.'" "Yes," said he. "That poor book! It was the very first book I ever wrote. It made a tremendous sensation, and I have been judged by it ever since. All my literary education I have had to pursue under the very eyes of the public. Was there ever a man since the world began so 'sair trodden down' -- as the Scotch say -- by his traditions. The 'Hansom Cab' is a regular Frankenstein's monster to me, and I am pursued through life by this monster, which, after all, is but the creation of an immature boy." I've mentioned the Melbourne bookseller, John Patrick Quaine (1883-1957) a few times on this blog. He was a well-known identity in Melbourne and a keen collector of Penny Bloods and Dreadfuls. Following is a short article about him, published in November 1945, that appeared in Bohemia: the All-Australian Literary Magazine, a rather grand title for the official organ of the Melbourne Bread and Cheese Club, of which Quaine was a member for many years. During the month the Worthy Scribe spent a bloodcurdling hour or two interviewing the Sanguinary-minded Fellow J. P. Quaine, the Bookaneer, and discovered it is just on 30 years since this gory Fellow burst into being as a bookseller like a bolt from the blue. Previous to that period his predatory performances had been confined to part-time prowling round secondhand bookshops, vainly seeking what the bookseller had already hunted for and failed to find ‑ a five pound book for four pence! He has since watched with a leaden eye similar optimists delving midst his own piles of dusty impedimenta. Though better known in recent years as a collector of "skulps," "Shilling Shockers" and "Penny Bloods," his collection of British First Editions was noteworthy. He specialised in this type of publication. His avaricious spirit often caused him to keep for himself the more desirable items; so he was never quite sure if he could be called a collector or salesman! However, the probe of impecuniosity compelled him to part from many of these cherished volumes. Since 1917 he has been a thorn in editorial cushions. Whenever his constitutional laziness could be overcome, he contributed special articles to the magazine supplements of the Melbourne papers, as well as inflicting his outpourings on interstate and even oversea editors! Being a dyed-in-the-wool Dickensian, he (by request) gave lectures and papers under the Auspices of the Melbourne Fellowship. As an additional example of the enormities he was capable of he compiled, in 1942, 30 talks, entitled "Tales of Terror Tactfully Retold" for the ABC. He has two testimonials upon which he preens himself. One is from Public Librarian Pitt thanking him for his assistance and exhibits during the Saturnalia attendant upon the Picwick Celebration in 1936, the other is from the late C. J. Dennis written in reply to a query in connection with "Herald" articles. It concludes thus: "I have your 'Duke and the Dustman's Daughter' here, which I am going to use. I shall be pleased to accept articles by you written in your inimitable style." Fellow Quaine says he would frame this note only he fears the green ink signatures might fade. Quaine admits that during the last few years his notoriety has waned somewhat; a new generation is rising that knoweth not Joseph. He has done everything but make money, and expects to finish up selling matches round the pubs! Here is an extract from an early article on ‘King of Bloods’ Edward Lloyd from Harper’s Magazine, vol. 64, 1882. The writer observes “Mr. Lloyd's story has never been quite exactly told,” and that still holds true. No mention is made of Lloyd’s early publishing ventures into Penny Bloods - not a respectable past for a successful newspaper tycoon. The approximately 200 Bloods that he published between 1836 and 1856 include such celebrated titles as James Malcolm Rymer’s Varney the Vampire and The String of Pearls and Thomas Peckett Prest’s Dickens’ imitations. "After inquiring for Mr. Lloyd at the palatial offices of The Daily Chronicle, I was directed to 12 Salisbury Court, and there in an unpretentious little room I found Mr. Edward Lloyd, a hale, hearty, middle-aged, florid-complexioned, white-haired gentleman. He introduced me to his son, a stalwart young fellow, who was amused at the surprise I expressed at not finding the head of the firm a tottering old gentleman of the aspect usually thought characteristic of Father Time and the venerable Parr. Mr. Lloyd is old enough to have originated the cheap press, and young enough to be vigorously occupied in establishing the newest daily paper. Responding to a remark about the literary interest of the locality in which I found him, he said, "This house use was Richardson's printing-office; in this room he wrote Pamela, and here Oliver Goldsmith acted as his reader.” The old familiar story: you are treading on historic ground every foot you move in London, historic not in a mere antiquarian sense, nor in the narrow meaning of age being historic, but in the breadth of human interest and universal fame. There is not a court hereabouts but it is linked with the history of all that is great and glorious in English letters, from Shakspeare to Hood, from Fielding to Thackeray, from Caxton, the first printer, to his great successors, and from The English Mercurie to The Daily News. ''I can show you Richardson's lease of these very premises," said Mr. Lloyd presently, and turning over the deeds which convey to him a large extent of the local freeholds (now strangely connected by passages and subways from Salisbury Court to Whitefriars), he handed me the parchment. It was a lease dated 30th May, 1770, from Mrs. Jennings to Mr. Richardson, the printer-novelist's signature a bolder one than would seem characteristic of the gentle tediousness of Pamela. Mr. Lloyd's freeholds and leaseholds are a curious mixture of properties, extending into Whitefriars, under streets and over streets, and they are all devoted to the mechanical requirements of Lloyd's Newspaper and The Daily Chronicle. The very latest inventions in the generation and use of steam, the newest ideas of Hoe in the way of printing, are pressed into the service of these two papers. Colonel Hoe is Mr. Lloyd's ideal machinist; Mr. Lloyd is Colonel Hoe's ideal newspaper proprietor. "No; I had once made up my mind to go, and had fixed upon the ship," Mr. Lloyd answered ‑ "the Arctic, I think she was called. Douglas Jerrold was against my going, and persuaded me all he could not to venture upon it. 'But,' said he, 'if you must go, give this play into Jim Wallack's own hands.' He gave me the manuscript of The Rent Day, which had been produced at Drury Lane. The object of my going was to see Hoe, and arrange for two machines on certain revised terms, so that if one broke clown, I should have another to fall back upon. Just before the time for sailing I received a letter from Hoe telling me that I could have just all I wanted. In consequence of that letter, I did not go. The ship I was booked for went to the bottom." Mr. Lloyd's story has never been quite exactly told. Briefly it is this. As early as 1829, when he was only fourteen, he was strongly imbued with Liberal opinions, and with the idea of starting a "free and independent newspaper" for their advocacy. There was a fourpenny stamp duty on each paper, and in due time Edward Lloyd labored hard with others in the direction of its reduction. He started a newspaper, and issued it without a government stamp; so likewise did other London printers; but after a short struggle they succumbed to legal proceedings for their suppression. In order to keep the question of unstamped papers before the public, Mr. Lloyd started a monthly unstamped journal, believing he could legally issue such a publication; but the Stamp‑office authorities stifled it with crushing promptitude, though it turned out afterward that he was within the law, Mr. Charles Dickens having, at a later date, issued a monthly paper on similar lines. In September, 1842, Mr. Lloyd published Lloyd's Penny Illustrated Newspaper, consisting chiefly of reviews of books, notices of theatres, and literary selections, thus keeping, as he thought, just outside the pale of what the law designated a newspaper. Within three months the Stamp‑office discovered what they regarded as a few lines of news in the literature of the journal, and they gave the proprietor notice that he must either stamp his paper or stop it. He chose the former course, and continued the paper at twopence until January, 1843, when he enlarged it to eight pages of five columns each (about the size of an eight-page Echo), called it Lloyd's Weekly London Newspaper, and charged two-pence‑halfpenny for it. During the same year he again increased its size, and sold it at threepence. At this time the general price of newspapers was sixpence, and they carried a penny stamp duty. Mr. Lloyd's innovation met with the determined opposition of the news agents. They one and all refused to sell the paper unless the owner allowed them the same profit per sheet which they obtained on the sixpenny journals. An offer of thirty per cent. was scoffed at, and the trade entered into a conspiracy to put down the three-penny weekly. The sale was considerably retarded by this opposition, but Lloyd pushed it by advertisement and otherwise, and the excellence and cheapness of the newspaper were attractions the trade could not annihilate. One of Lloyd's methods of making it known was ingenious, not to say daring. He had a stamping machine constructed for embossing pennies with the name and price of his journal, and the fact that it could be obtained "post free." The announcement was made in a neat circle round the coin on both sides. The machine turned out two hundred and fifty an hour, and Lloyd used up all the pennies he could lay his hands on. The Times drew attention to the defacement of his Majesty's coinage, and thus gave the paper a cheap and important advertisement. Parliament passed an act against the mutilation of the currency. The affair helped to make the threepenny paper known, and in spite of "the Trade," which continued to oppose it, holding meetings and combining against it in every way, it progressed in circulation and influence. From a sale of 33,000 in 1848, it rose year by year to 90,000 a week in 1853. Two years later than this, Lloyd had lived to see the most ardent desire of his life accomplished the passing of an act abolishing the stamp duty, and the establishment of a really free and unfettered press. From this period dates the enormous success of Lloyd's Newspaper. The question of production was tile next serious question. Mr. Lloyd put himself in communication with Messrs. Hoe and Co., of New York, which led to his introduction of their rotary printing-machine. The success of this new invention, exemplified in Lloyd's offices, elicited a general acknowledgment of its superiority over all others, and "the Hoe" was at once adopted, not only in the chief London offices, but by the leading newspaper proprietors of the country, and in Ireland and Scotland. Wherever there was a journal with a large circulation, there "the Hoe" became a necessity." Tolkien Studies Volume 7 (2010) goes to the printer! Volume 7 of Tolkien Studies: An Annual Scholarly Review finally goes to the printer today, and I can release the table of contents. This is the largest volume ever, and I regret to say that some material planned for this volume didn't make it in. A long book review got bumped to the next volume, and the Cumulative Index to volumes one through five will be available, for the time being, only through Project Muse, once volume 7 goes live (soon). Subscribers to the hardcover volumes of Tolkien Studies should receive their copies sometime in August. "I have been reading and looking for Karl Hanns Strobl, a dark prince of German horror and is amazing and disturbing how many blogs related to viagra online [link removed] are in the web. But anyways, thanks for sharing your inputs, they are really interesting. Have a nice day."